Fashion has never really been important to me. I wear what is comfortable and what looks nice on my body. I do care about looking nice but in the past this has only required nice jeans, plain ‘ole t-shirts, some cute dresses, and jackets. I am OBSESSED with comfy jackets over plain t-shirts that I dress up with a fun necklace or scarf. This fashion philosophy works amazingly for me. Because of my simple philosophy, I really haven’t updated my wardrobe much since high school. (Hence, my recent urge to clean all “teen” clothes out of my closet.) So earlier this week I went on a fun shopping trip with my mom and we managed to find some fun new adult pieces to add to my wardrobe! 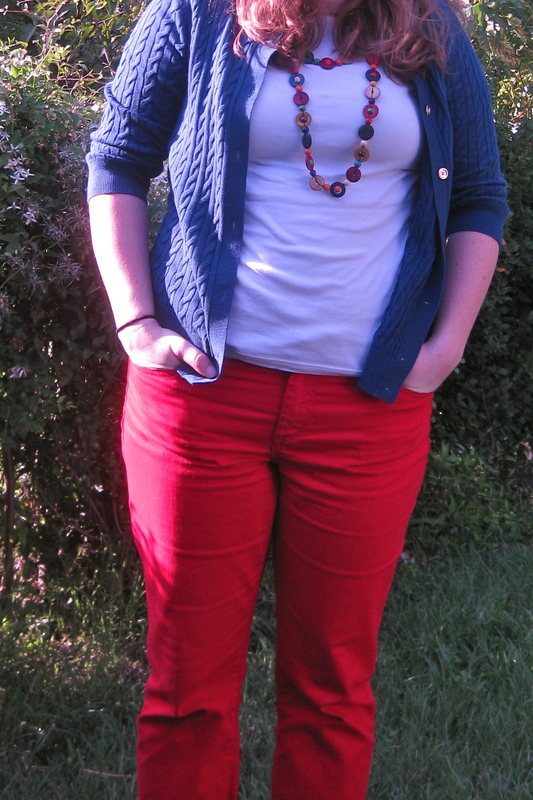 First off, I jumped on the colored jeans bandwagon. 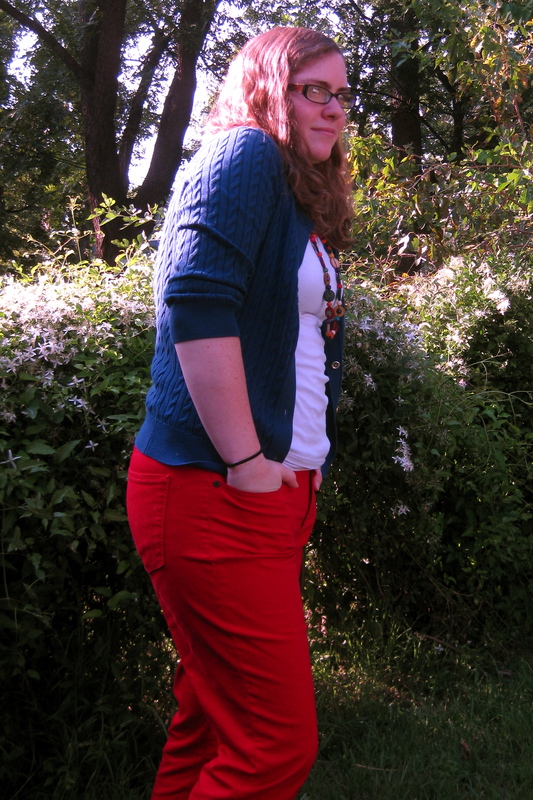 And, let me say, I am LOVING my new red jeans! As you can tell, I LOVE sales! I wait to do most of my shopping during huge sales and I learned from the best: my mother. This particular trip started and ended at Talbots. Yes, I know, their regular prices are quite high but trust me, mom and I scored some awesome sales. They have huge sales about twice every year and they are SOOO worth it! Talbots makes very nice clothes that last, which I love. I don’t want clothes that fall apart after a couple of months. I still have Talbots clothes from 5 or 6 years ago that are in great condition after being worn hundreds of times. I bought 3 pairs of cropped pants, 2 dresses, 2 sweaters, 1 jacket, and 2 nice silk shirts. Originally, this haul cost $893! That’s a lot of moolah that I don’t have to spend on clothes. All these pieces were marked down to $388.92. That is okay but we can do better! After being marked down, they were then placed on racks that said, “Additional 60% off sale prices!” Now we’re talking! In the end, we spent $167! I know, this is still a fairly decent amount but keep in mind that this was a huge update to my wardrobe with 10 new versatile pieces. I will be sharing the rest of the new wardrobe as it gets mixed in with my current wardrobe the rest of this week and next week! 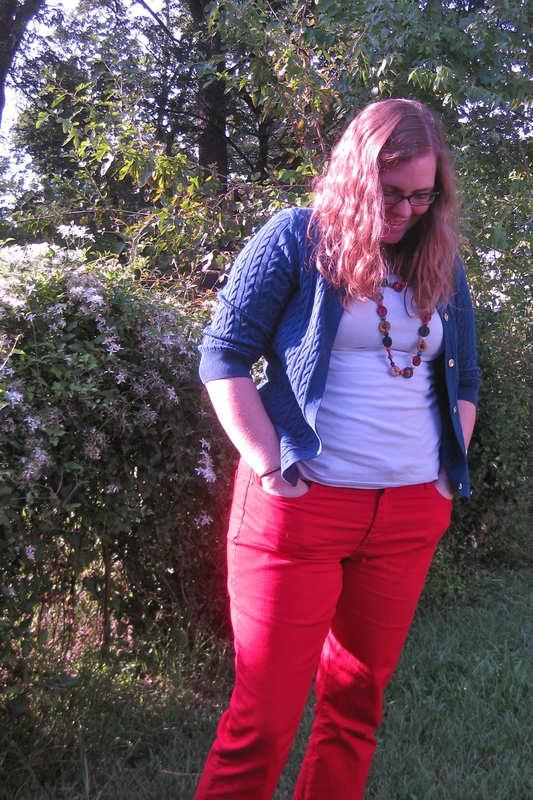 Disclaimer: I am not being paid to promote Talbots in any way. I just really like their clothes. This entry was posted in My Life, My style and tagged blue sweater, clearance, clothes shopping, clothing, cute dresses, fashion, fashion philosophy, new clothes, new wardrobe, photography, plain t shirts, red jeans, sales, shopping, shopping with my mom, style, sweater, talbots, teen clothes by Shannon Hruska. Bookmark the permalink. Sounds like we’re in the same boat. Did you just graduate college, too? I have way too many high school tops that just aren’t cutting it. Lots of graphic t-shirts ended up in the Goodwill pile in April. Sad but true. I graduated a couple of years ago but I just recently moved away from my college town so it was the perfect time to start cleaning out my closet. I cleaned out several tube tops or shirts that were old and yucky from high school. I am so happy to have a much more mature wardrobe!